The Walker Channel, in existence since 2003, has recently undergone a re-design. 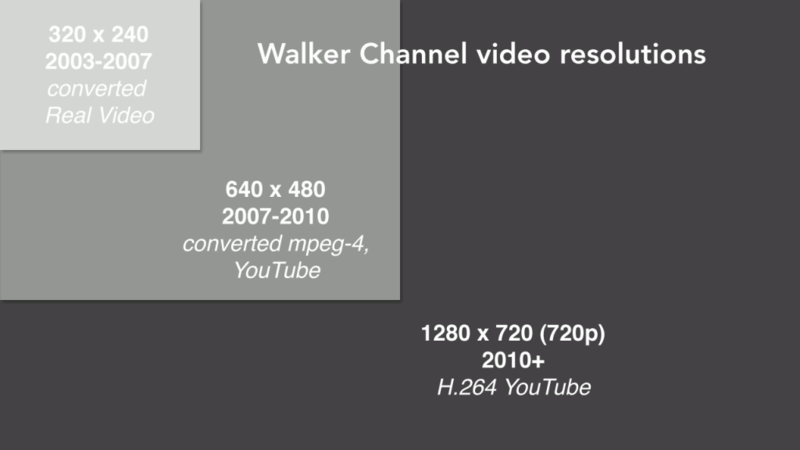 The old Walker Channel was originally built to serve Real Video and stream live webcasts using Real Video. It had slowly evolved over time to use more friendly MPEG-4 and H.264 video, and even moved from Real Video for live streaming to the better ustream.tv. But it never really caught up to the modern, YouTube era of video. The re-design we just completed did that, and added a few other goodies. Quite obviously, the site has undergone a major visual overhaul. The old site had almost no hierarchy to the video archive, which worked OK with a handful of video, but with 200+ in the archive, it became unwieldy to find a particular video or just browse. Just like with our iTunes U site, we’ve split our internal, museum centric departments into more logical genres. For example, instead of just “Performing Arts”, we have Dance, Theater and Music. We also highlight content by it’s recentness, and, more importantly by it’s popularity (view count). None of this is ground-breaking in 2010, but it’s a big upgrade from 2003. We’re now serving all our video content as streaming h.264 video. This means you can watch a video and jump to any place in the timeline before it has buffered to that spot. Using h.264 enables us to easily switch to HTML5 and support other devices down the road. We converted all our older Real Media video into h.264 mp4s. We also utilize YouTube to serve many of our newer videos. We have already been putting all our Channel content on YouTube for about a year, so there’s no need to upload it twice. YouTube serves a relatively high-quality FLV or MP4 file, and this means we do not pay for bandwidth, which is not an insignificant cost consideration. Where we’re not using YouTube, we’re using Amazon CloudFront and their new Adobe Streaming Media Server. This means that we don’t have to run our own instances of EC2 and Wowza to encode & stream the video. We upload our video manually, so we don’t need to encode our video in “the cloud”. Click to enlarge and get the full effect. We have also added a video switcher to our hardware repertoire. The switcher lets us show the presenter’s slides, in-stream, rather than just pointing the camera at the projection screen. This switcher enables a dramatic improvement in video quality, and will be especially useful for Architecture / Design lectures, which typically feature many slides. It enables you to visually scan the contents of a video to key on a section you want to watch. In the example video, clicking on the time code on the right jumps the playhead to that point in the video. It gives us much more meaningful text to search on. Search engines are still text based, so having more than just the video description to search, is a great thing. We create our transcripts by sending our video to CastingWords. The transcripts that CastingWords generates is then fed into YouTube’s machine caption processing feature, generating a captions for the video in the form of a .SBV file. The .SBV file is then pulled back into the Walker Channel, where we convert it on the fly to W3C TimedText format for use in jwplayer as captions. Note the fragmented captions (in video) with transcript (below), in full sentences. We’ve added comments! Like what you see or want to add your thoughts? Leave a note. One neat thing in the comments that we convert mentions of specific time into a link to jump the video playhead. So if you leave a comment with 3:13 in it, it will turn into a link to that spot in the video. Similarly, when that happens we change the hash for the page to a link to that spot. 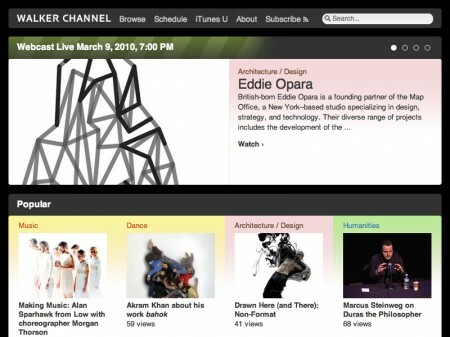 The URL will change from http://channel.walkerart.org/play/my-video/ to http://channel.walkerart.org/play/my-video/#t=3m3s. Using that link anywhere else will jump the playhead to that point in the video. YouTube does the same thing, so we borrowed the idea. We’re using solr for the search engine on the channel. Nate had great success with solr on ArtsConnectEd, so using solr was a no-brainer for us. The rest of the logic for the channel is built using Django, a python web framework that I also worked with for the My Yard Our Message project. To connect Django and solr, we’re using django-solr-search (aka “solango”). It was necessary to sub-class parts of solango to get it to present solr’s more-like-this functionality that we use for the “Related Media”. In retrospect, I probably should have used Haystack Search instead, since it supports that natively. As we move forward using solr and django in other areas of the Walker’s website, we’ll probably switch to using Haystack. Funding for aspects of these updates came from the Bush Foundation, under a grant entitled “Expanding the Rules of Engagement with Artists and Audiences and Fostering Creative Capital in our Community“. This grant has many applications within the Walker as a whole, but for the online Walker Channel, it is specifically funding the upgrade of our camera and video equipment.